The Wrong Man boasts a star studded cast that includes Josh Harnett as Slevin, a young man who is mistaken for a gambler and the son of a crime boss with a debt, only to be caught in a vicious battle between two warring crime bosses that include The Boss (Morgan Freeman) and The Rabbi (Ben Kingsley). With nowhere to turn, he finds an ally in Lindsey, played by the beautiful Lucy Liu who may not be as innocent as she seems. The Wrong Man is your classic crime thriller that contains a variety of genres which include action, drama and a touch of predictable and forced romance. At times, The Wrong Man has elements of the Bourne Identity with Hartnett's character, however the star of the film for me was Bruce Willis who has some great scenes in this movie, even though he is not the star billing. 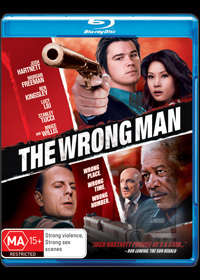 With an interesting twist, The Wrong Man has been on DVD for quite some time now, however for those who have never seen the movie and own a Blu-ray player than we could happily recommend this crime noir thriller. The Blu-ray version contains some exceptionally sharp images and great audio quality that at times it feels like the movie was filmed yesterday and sounds phenomenal through our Logitech surround sound setup. Definitely a movie for those who enjoy a challenging yet sometimes predictable crime thriller.